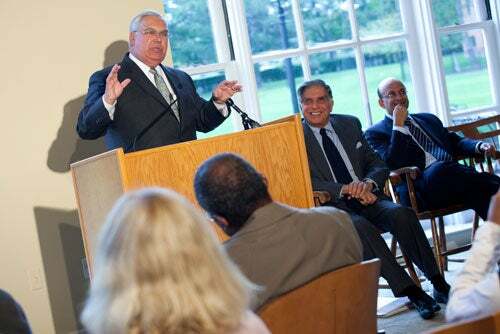 Harvard Business School has received a gift of $50 million from the Tata Trusts and Companies. This marks the School’s largest international donation in its 102-year history. Ratan Tata (from left), the chairman of Tata Sons Ltd., meets with Harvard President Drew Faust and Harvard Business School Dean Nitin Nohria. Hoping to spur innovation at Harvard and in the surrounding community while providing a spark for the economy, the Harvard Business School (HBS) announced plans Thursday (Oct. 14) for two building projects, one aimed at training new global leaders and the other at fostering entrepreneurship. At an afternoon press conference on the HBS campus, Dean Nitin Nohria announced that the Tata Companies, the Sir Dorabji Tata Trust, and the Tata Education and Development Trust, which are philanthropic arms of the Tata Group, India’s largest company, are donating $50 million to the School. The gift, the largest from an international donor in the School’s history, will fund a new HBS facility to support the School’s broad range of executive education programs. Calling it a privilege and a pleasure to “give back to Harvard a little bit of what it gave to me,” Ratan Tata, chairman of Tata Sons Ltd., said he hoped the new facility would both encourage and inspire future leaders to take advantage of the executive education offerings at HBS. Tata attended the Advanced Management Program in 1975, one of three executive leadership programs offered by HBS. Founded in 1868, the Tata Group comprises more than 90 companies in seven business sectors: communications and information technology; engineering; materials; services; energy; consumer products; and chemicals. Known for its innovative philosophy, the international corporation has created pioneering innovations like the new Tata Nano, a $2,500, two-cylinder car that seats four and gets 55 miles to the gallon. Officials hope to break ground next spring for the new academic and residential building, to be named Tata Hall, with completion scheduled for the fall of 2013. The building will be situated on the parcel in front of Kresge Hall, facing Soldiers Field Road. Additionally, Nohria announced creation of the first-of-its-kind innovation center in Allston, a vital resource to help stimulate collaborative creativity and entrepreneurship across the University’s Schools, at HBS, and throughout the Boston community. Funded by HBS, the Harvard Innovation Lab (Hi-Lab) is scheduled to open in the fall of 2011 on Western Avenue in the Allston building that formerly housed public broadcaster WGBH. In the facility’s first phase, the site will open to undergraduate and graduate students from across the University, providing student teams working on their ventures with study space, along with access to and support from entrepreneurs-in-residence, faculty, and administrators. It also will offer entrepreneurship and innovation programming. The second phase of the launch will include collaborations involving the lab, small businesses, and local entrepreneurs. Boston Mayor Thomas M. Menino, who has made innovation a hallmark of his fifth term in office and recently backed creating an “innovation district” along the South Boston waterfront to spur business development, praised Harvard’s new initiatives as important drivers of the economy.